After welcome drinks, guests were shown through to the spectacular Monarch Suite, dressed in all its glory, with beautifully laid out tables, black, emerald & purple covered chairs and gorgeous centre pieces supplied by Covered in Love of Solihull and a back drop with a Celtic feel superbly organised by Lemon Zest Events. We were welcomed in to the room by songs from the cast of Once, The Musical, who also played for us during dinner. The guests were then called to dinner by the sounds of the traditional Scottish bagpipes from Stuart MacLaghlan, The Travelling Bagpiper. 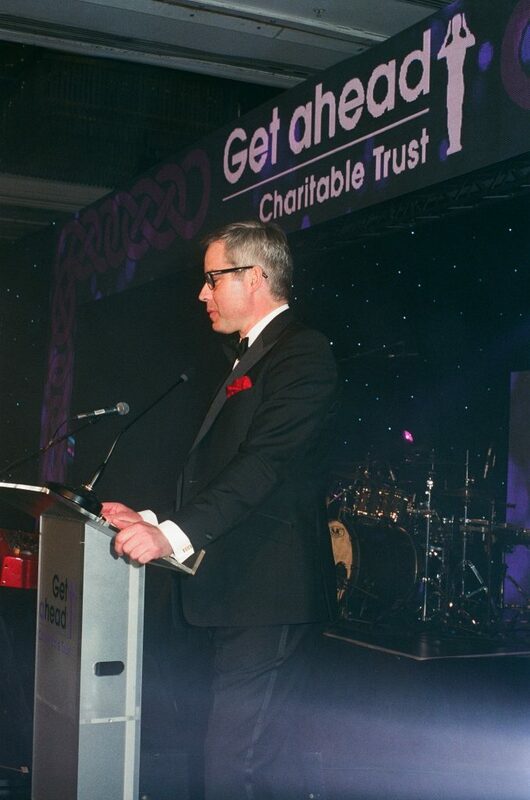 Tom Bromwich, Chairman of Get A-Head, thanked all who had attended and all those that played a part in the evening during his speech and went on to say Get A-Head are going from strength to strength and will continue to strive to achieve our goal of helping patients and their families suffering with head and neck disease and head and neck cancers. We then had a spine-chilling performance from Emerald Storm, a superb dance troupe, who performed their own special blend of urban Irish Dancing and received a well-deserved standing ovation. 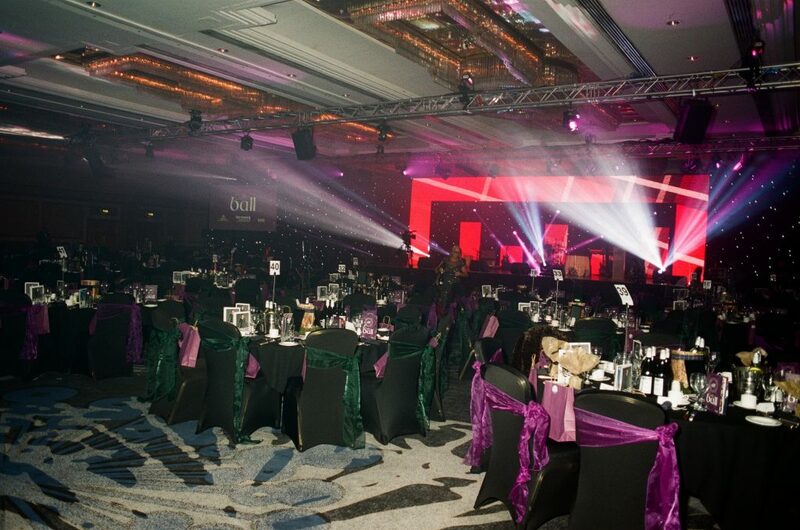 Special thanks must go to David Senior from Le Mark Group who generously donated the specialist Dance Floor for the dancers. Two short films were shown to the guests during the evening featuring two of our patients and their families who have benefited from the work we are involved in, you can see these videos on our website here. Peter McNeil, our newest Trustee and head & neck patient spoke to the guests and detailed the work Get A-Head do and how it benefits patients like him. This then led us into our main auction, fantastically undertaken by James Hawkesford of Hawkesford Auctioneers with A Factory Tour of Aston Martin up for grabs in the first lot, kindly donated by Aston Martin, followed by many other excellent and exceptional prizes, including a Golf Break at Trump Turnberry donated by Peter McNeil, a Complete Bespoke Wardrobe of Clothing donated by Clements and Church, and a whole host of other fab prizes. We also had lots more fundraising going on during the evening in the forms of Higher or Lower, a Raffle, Silent Auction all with fantastic prizes and a Special Green Envelope Draw with a £1000 House of Fraser Voucher up for grabs. 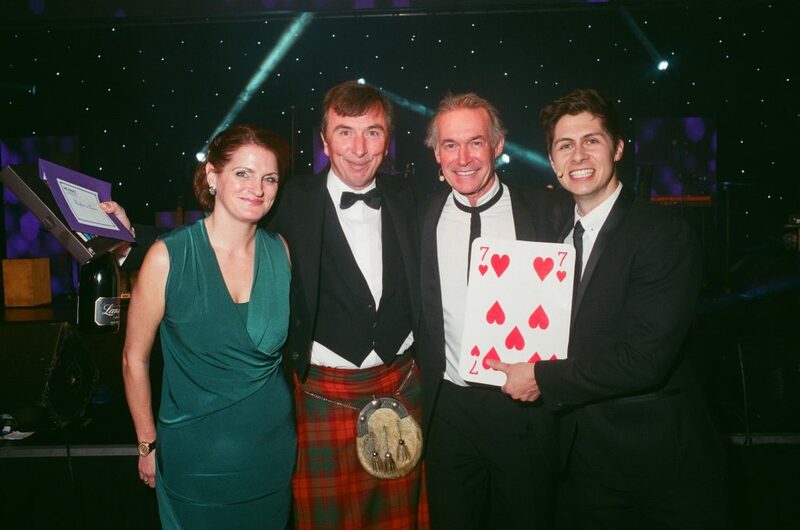 Rod Woodward, the award winning comedian was our headliner and entertained our guests with his own brand of humour. After the fundraising and auctions, the evening ended on a real high note with live music and a smashing performance from Detroit Soul Collective, the dance floor certainly got put through its paces as the crowd were pulling out all the moves and enjoying the electric atmosphere! 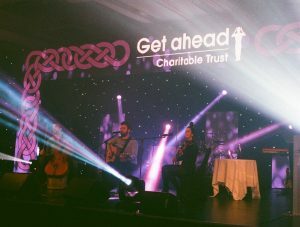 Louise Newton, Charity Manager said of the night: “Wow, what an amazing night the Celtic Ball was, with magic, music, lightening footwork and lots of laughter, bidding to dancing and everything in between. Thank you to all who came and enjoyed and we look forward to welcoming you to next year’s event!